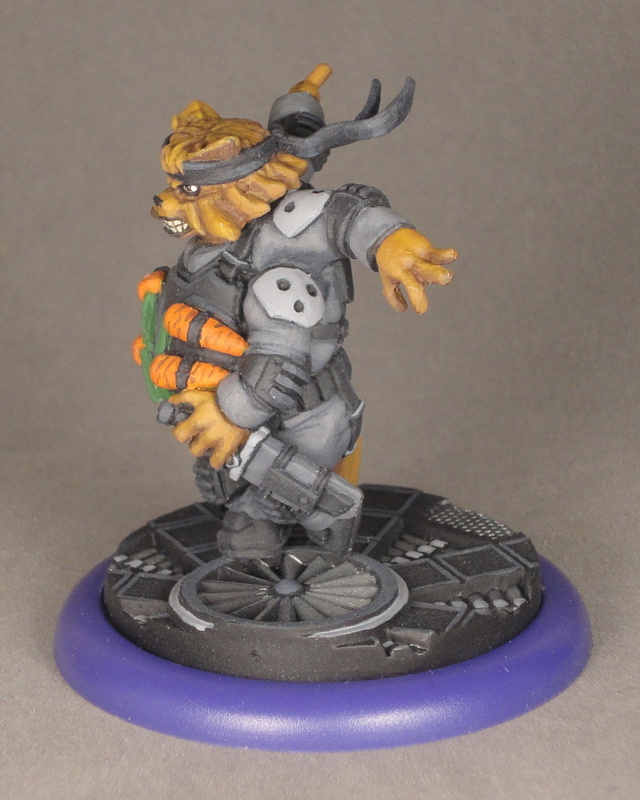 Here is Darkspace Iron Chef, aka “Solid Chef” or “Solid Snack” for Relic Knights. 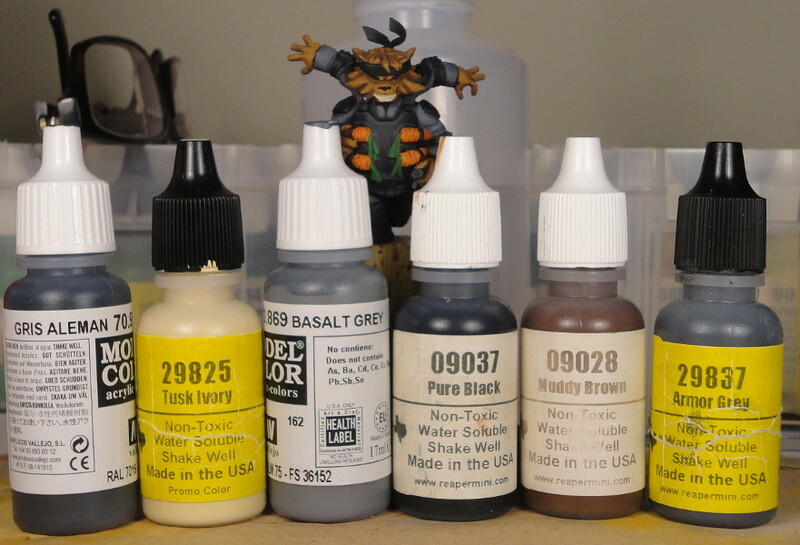 For scale, Solid Chef sits on a 50mm base. Lots of greys on him, as is typical of Black Diamond, but also a few bits of color on his fur and his snacks. 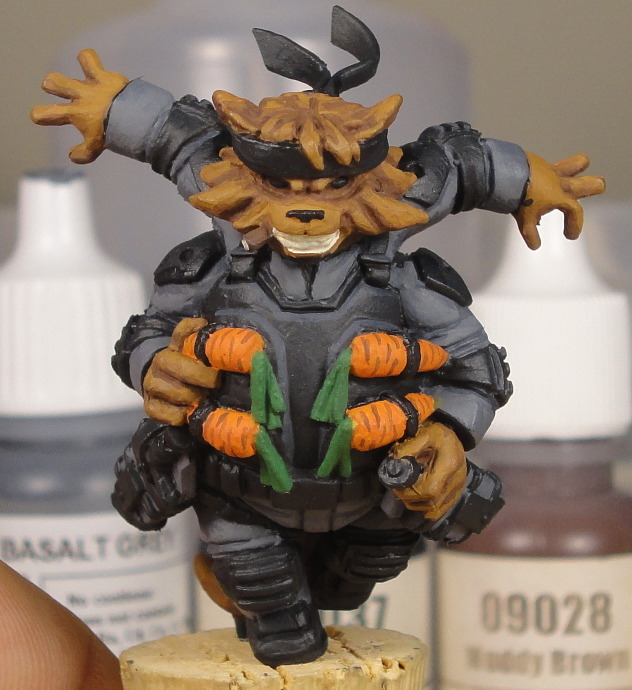 I’m very happy with how the carrots came out, but I am most proud of his eyes. They are fairly large and I was able to get dks eyes going on and he doesn’t look too walleyed. I used the same matte vanish as before but didn’t spray from so far away, which has eliminated most of the graininess. 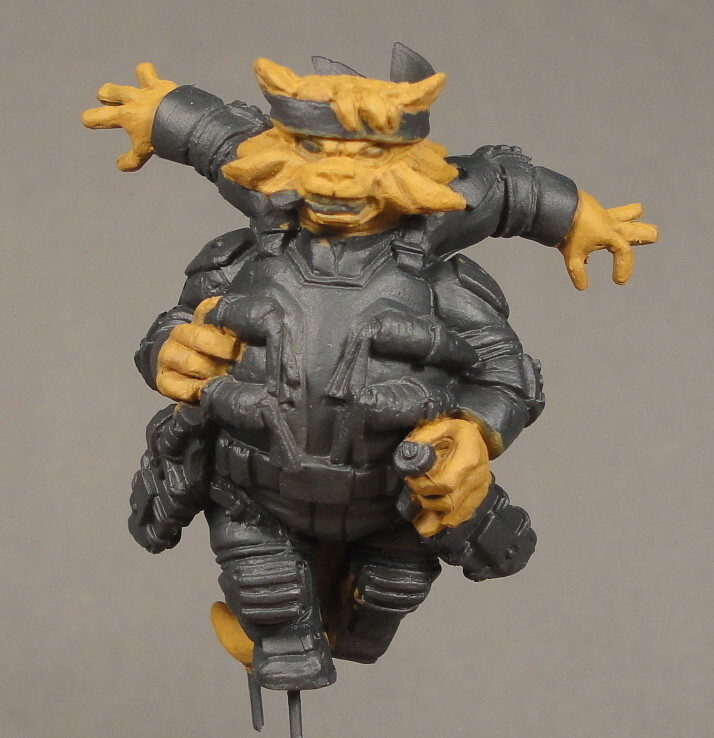 Put a few more detail on Solid Chef yesterday and today. 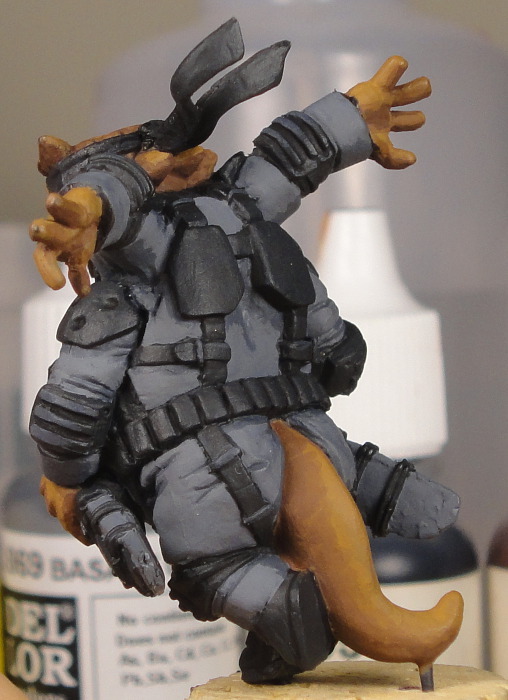 Put a few more grey details (including Rainy Grey shoulder pads), and put highlights on the fur. Also drew in the teeth. 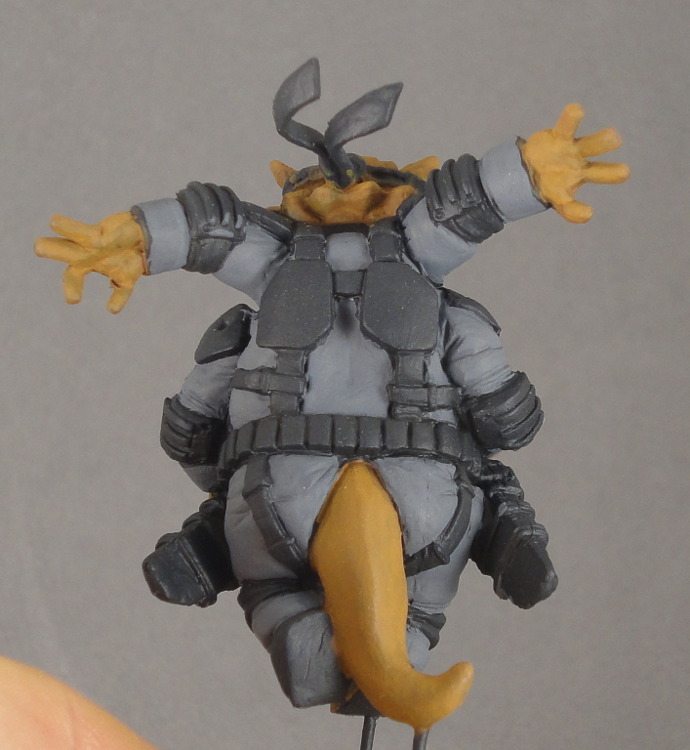 Next step will be highlights on the greys, and smooth out some of the transitions (I will have to remind myself that he’s tabletop quality though, so I don’t have to make them perfect). 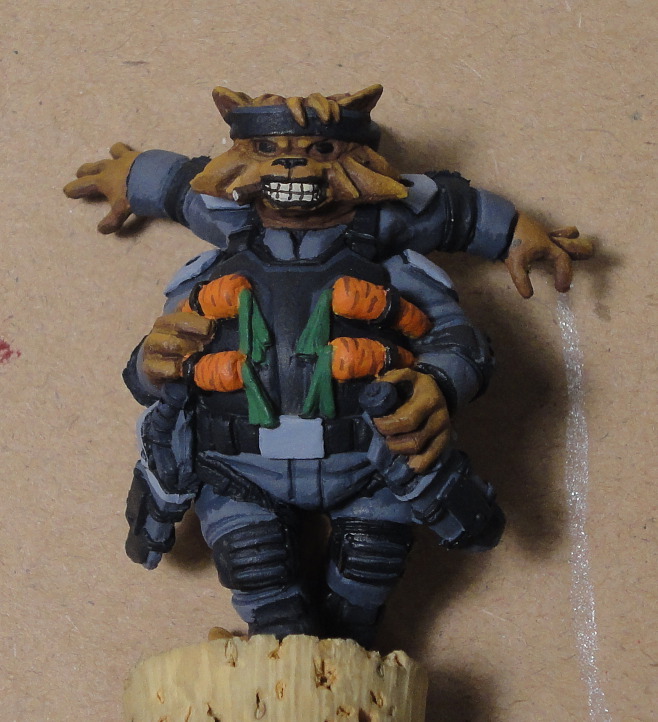 Also need to do something with the eyes… I was just going to leave them black, but they look really weird like that. Here are the results of a few more sessions of working on Iron Chef. 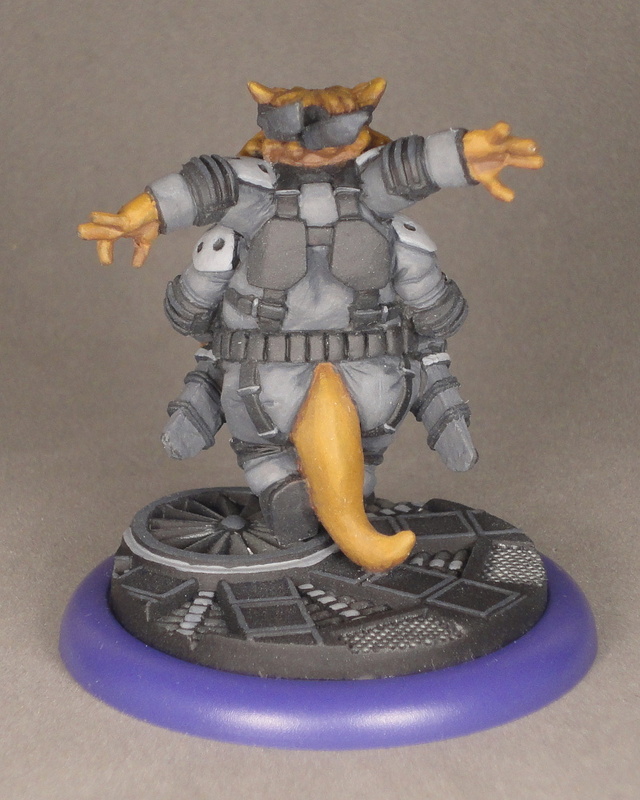 I finished the basecoating and started to work on the details. 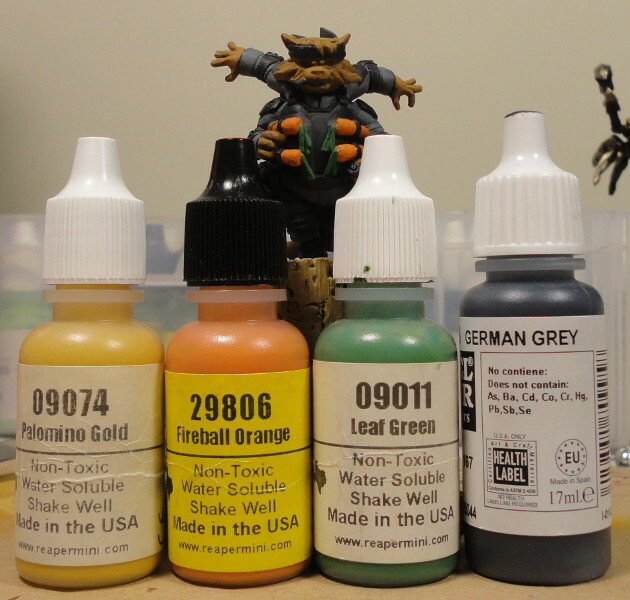 The Palamino Gold is used as an undercoat for the carrots since orange doesn’t cover well. 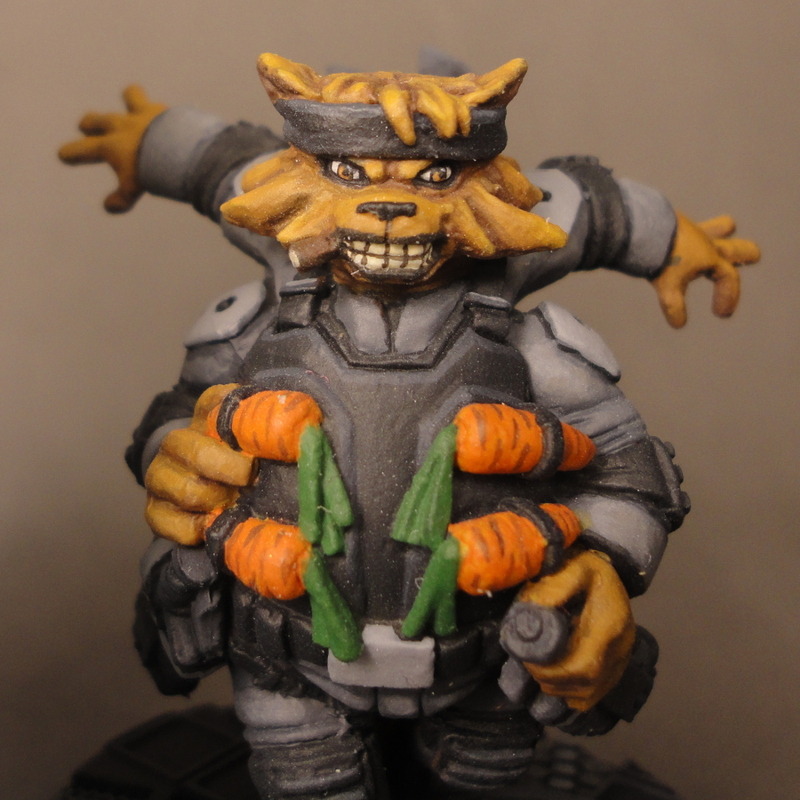 Darkspace Iron Chef, aka “Solid Snack” is currently on my painting table. Regular Iron Chef works for the Star Nebula Corsairs. 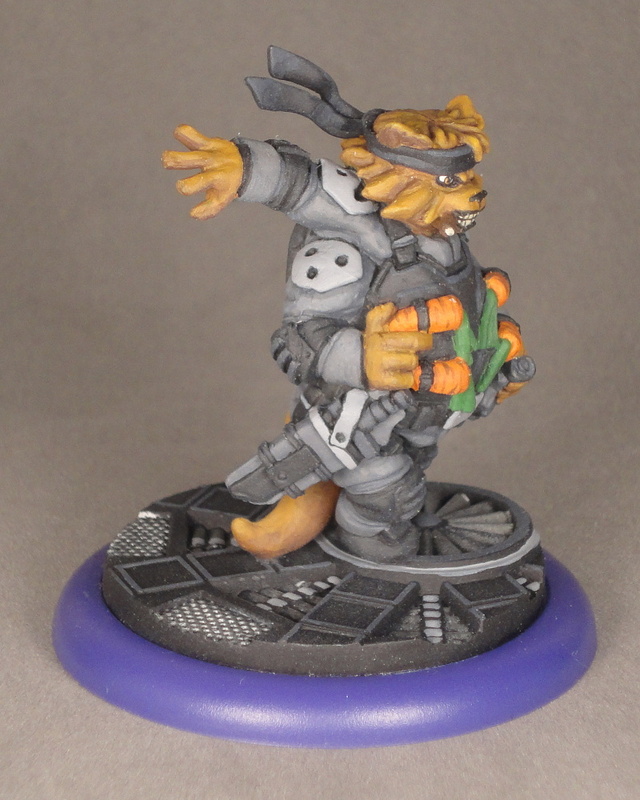 Darkspace Iron Chef (like all the Darkspace figures) is an homage to a famous Japanese video game/anime, in this case Solid Snake from the Metal Gear games. I’m going to paint his outfit up relatively faithfully. This is a weekend-update type post. First off, I got a lot of good work done on Project G. Only one bit completely naked (no base coat), and about half the detailing is done. With luck I can finish him up this week – though it might be difficult to get in time during the week since I’ll be out on travel for a few days. 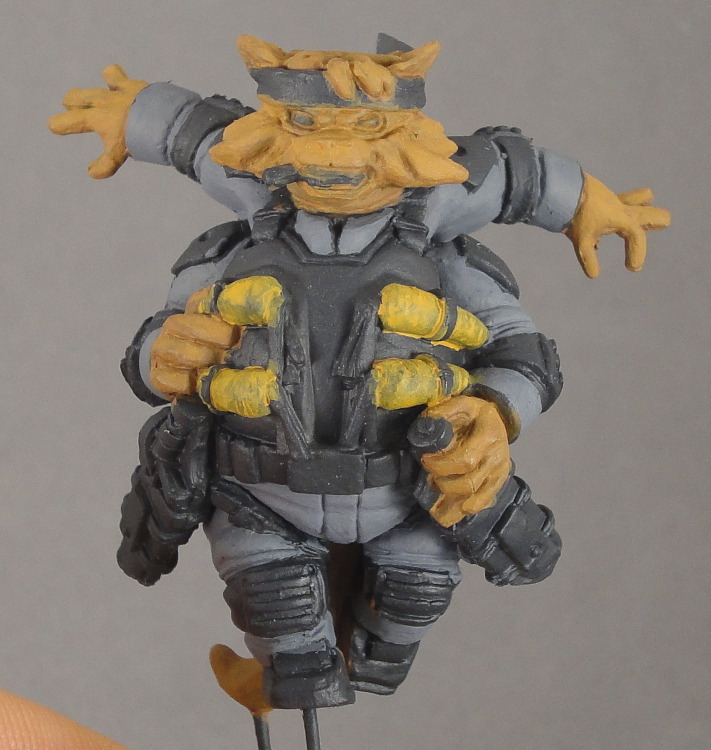 I started working on Darkspace Iron Chef from Relic Knights. aka “Solid Snack”. 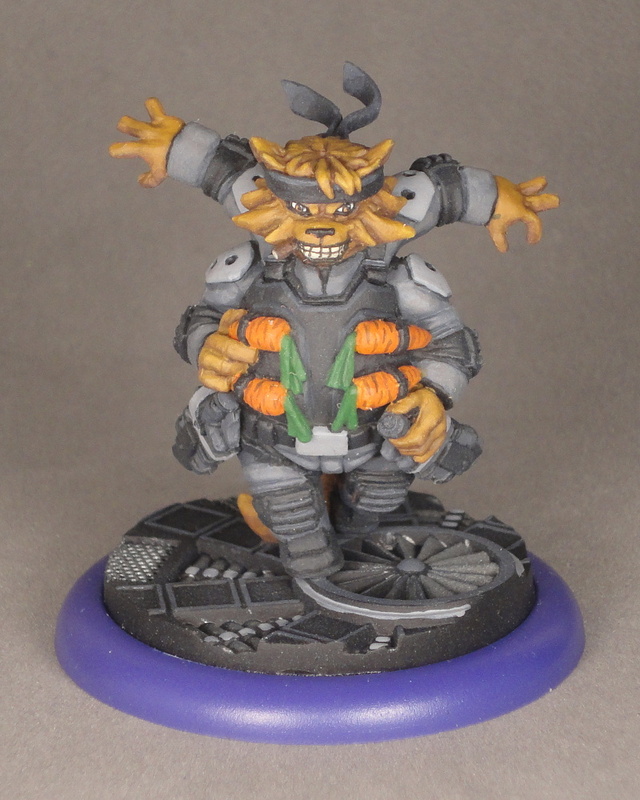 And also Lorenzo Cortez from Anima Tactics who has been sitting primer in my drawer of shame for quite a while now. 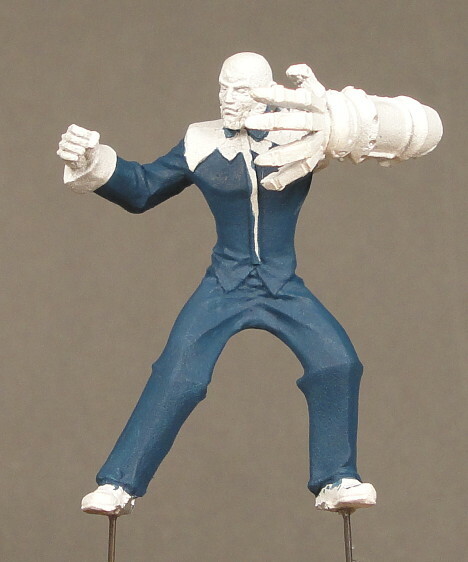 I’m looking forward to using MSP Clockwork Brass on his arm.